Cooler weather is here, and that means tailgate parties and the holidays are coming! This recipe is super easy to whip together quickly for a large group, or you can even prepare in advance in a crockpot. Create a topping bar and let your guests top their chili however they choose! Place thighs and marinade in a large saucepan. Cook on medium until thighs are cooked through and falling apart (about 30-40 minutes). Break up any big chunks of chicken. When chicken is cooked, use a wadded up paper towel held with tongs to blot any fat from the surface of the chicken mixture. Add remaining ingredients and simmer together for half hour, sirring occasionally. 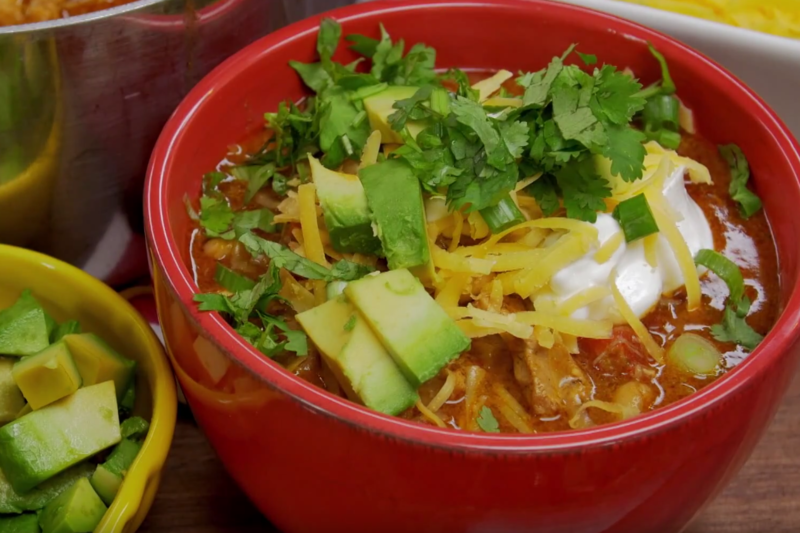 Finally, serve with your favorite chili toppings, like sour cream, grated cheese, avocado, and chopped fresh cilantro!